إن فندق فندق مانترا أون ذا كواي بموقعه الممتاز في مركز مدينة بريسبان هو نقطة انطلاق جيدة لنزهاتك في بريسبان. يجذب هذا الفندق ذو 4 نجوم، والذي يبعد 1.0 Km فقط عن وسط المدينة و 18.0 Km عن المطار، الكثير من الزوار سنوياً. يشكل هذا الفندق ملاذاَ مريحاً للاسترخاء ويمنح زواره فرصة للاستجمام والتجدد، وهو يقع على بعد خطوات من المعالم السياحية الكثيرة للمدينة كمثل: معتكف القبة, ‪Ann Street‬, ‪Webber House‬. يقدم فندق مانترا أون ذا كواي خدمات لا غبار عليها وكل أشكال اللياقة وحسن الضيافة اللازمة لإسعاد ضيوفه. لضمان راحة ضيوفه، يقدم الفندق الخدمات التالية: متجر, توصيل من البقالية, مرافق مخصصة لذوي الاحتياجات الخاصة, تخزين الأمتعة, صف السيارات . تنعكس أجواء فندق مانترا أون ذا كواي في غرف الضيوف.شاي مجاني, مناشف, سجاد, قهوة فورية مجانية, غرفة معيشة منفصلة هي بعض الميزات الموجود في العديد من الغرف. كما أن مجموعة الخدمات الواسعة الموجودة في الفندق لضمان راحتك تترك لك الكثير من الخيارات لقضاء وقتك أثناء فترة إقامتك. يحظى فندق فندق مانترا أون ذا كواي بموقع ممتاز وخدمات يصعب منافستها. Comfortable, spacious & clean room. Equiped with washing machine & dryer. Kitchen is also fully equiped. Nice view of the Brisbane river. Late check-in is a bit interesting because the reception will be closed. I was given a password to enter the lobby & instruction to locate a safe. Another password was then given to open the safe to get my room key. The hotel is located near the CBD. Very near to shopping & food. The ferry pier is just around 10 minutes walk along the riverside. Very relaxing place to stay especially with children. 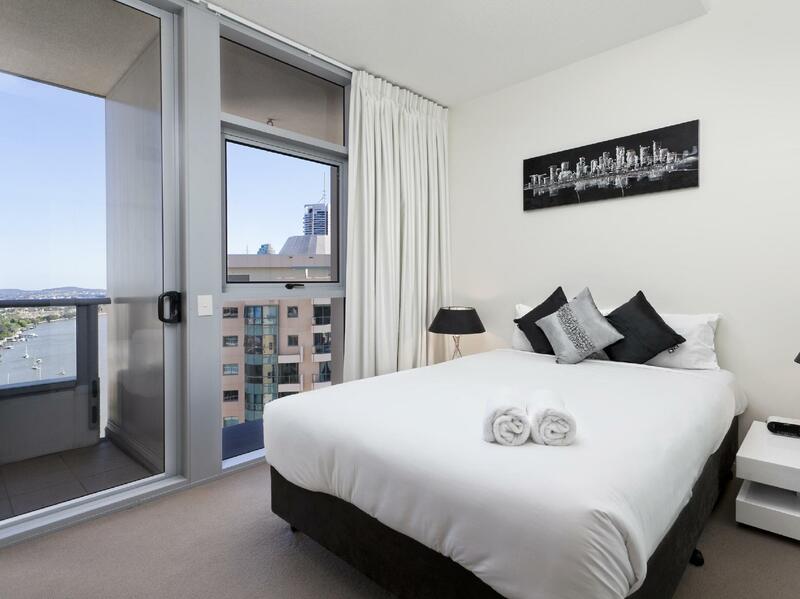 Our stay at Mint Brisbane is really awesome and we love it there! Check-in was quick and smooth. When we opened the door, we were amaze at everything. From the kitchen facilities, dining table, living room, bedrooms, toilets etc, everything is great! Will definitely stay here the next time when i come Brisbane and strongly recommend this to all my friends and people reading this! 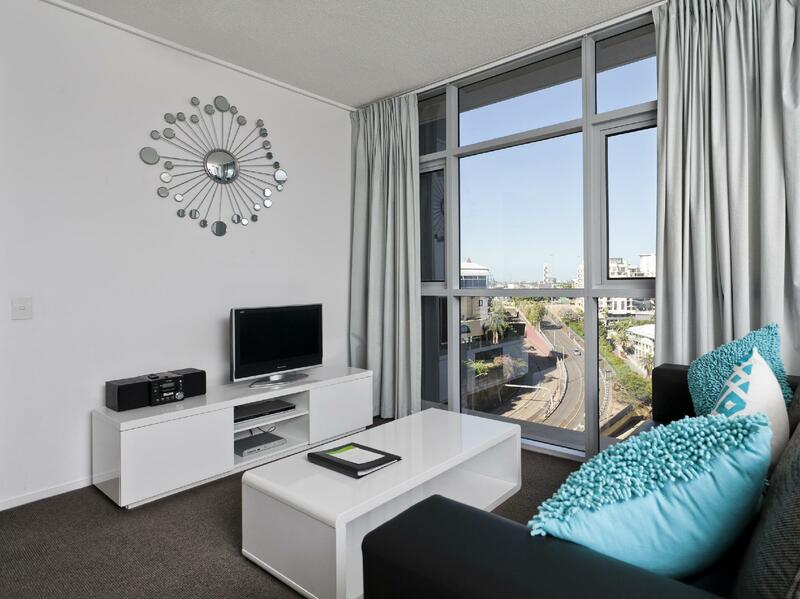 By the way, if you are having a hard time finding Mint Brisbane, its written Skyline Apartment outside.. The white interior apartment. we have a pleasant stay at this apartment. the unit is well equipped and the design of the unit is very modern. 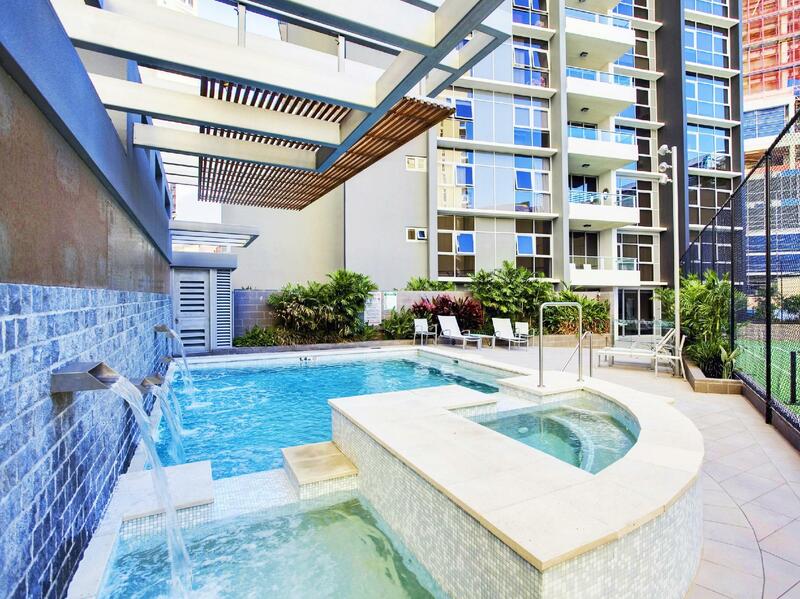 the location is very close to the brisbane cbd (about 5 minutes walk to the queen street and eagle street). it has a very big balcony with a big coffee table there. you can sit there to have a cup of coffee while enjoy the beautiful view to the city and the brisbane river. the story bridge is just a 5 minutes walk. 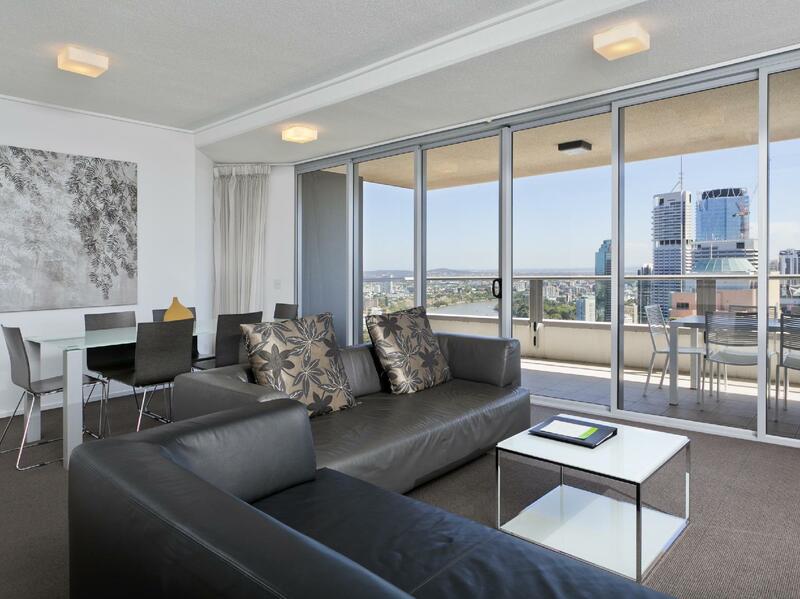 if i ever going to brisbane again, i would definately staying in this apartment. upon arrival we had a very quick check in and the staff were very friendly. in our room we had a nice surprise as the balcony faced the story bridge. we had a full kitchen and the seperate bathrooms made things a little easier for our group. it was a very easy walk to clubs, bottleshop, water taxi, train, restaurants and queen street mall. i don't think the rooms are serviced and as reception closes early on weekends we needed to buy extra toilet paper and book a car spot early. i would recommend this hotel for the business traveller, groups or mature families probably without little kids as i did not see much that would suit them. This is a newish apartment complex, with a security entrance. No afterhours reception desk, but you can contact the afterhours service for room access. Great roomy rooms and bathrooms. A very nice place to stay. Booked 3 beds apartment for one night. Dryer doesn’t work(can not get this sorted & can’t change another room ); wifi signal can only be reach in one room only; the surface of all 6 dining chair are scaling; hot water system is really bad ( hot & cold change frequently during a 5 mins’s shower); got some hair on the towers; when we check in the room, there are some rubbish already in the bin. Even the staffs are very friendly, will not book this accommodation again! Big apartment size (much larger than a hotel room), from Brisbane airport - train to central then 10min walk, very good location. The staff member that checked me in, did not really give me any details, she did not explain the car park or the keys and furthermore did not explain that there was a bond, simply putting the eftpos machine in front of me with my card in it. This was the only disappointment for the whole stay though as the apartment itself was incredible! Hotel is located in a perfect location! Security is good too. Brisbane river boardwalk is just there for a morning jog. Rental car, grocery store, restaurants, coffee shops.... All are within a walking distance (less than 10minues of walk) Place was clean. Loved they got both laundry/dryer machines equipped too. Since we don't like eating all the time, it was very nice to have a decent size of kitchen and they got all we needed to cook. Staff was nice and friendly too. Clean, friendly staff, great location with fabulous views. We enjoyed our stay very much. It was very comfortable, relaxing and within easy walking distance to shops, transport, and great restaurants. The staff were friendly and helpful and we would recommend this hotel to anyone visiting Brisbane. Good staff make the check in very easy. As a self catering hotel apartment there are no in house restaurants so the only staff I saw were on reception. The location is good, a short walk to the city center via the river walk, or in the opposite direction to the suburbs where there are plenty of coffee shops etc. 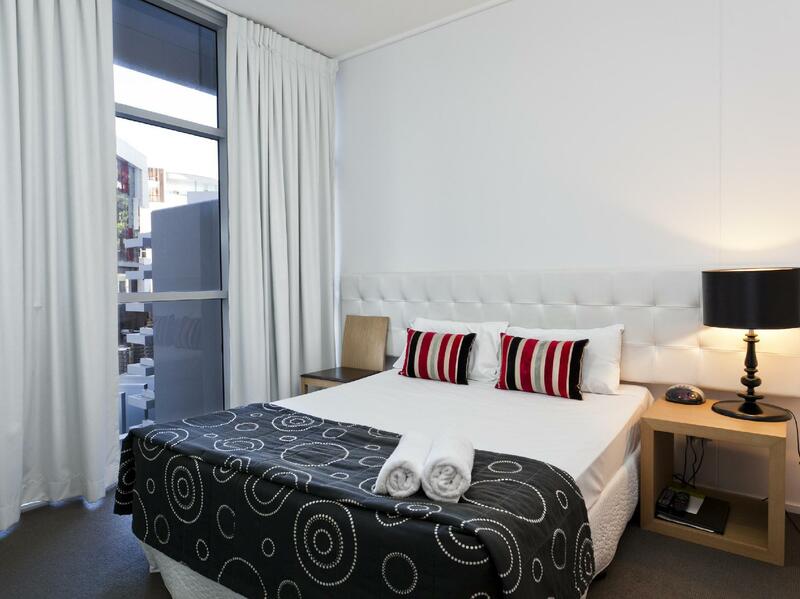 Our stay at Mint Brisbane Hotel was very enjoyable. With a location close to numerous eating places, river walks and public transport, we were able to enjoy many outings around the city. One our rerun to the hotel we could relax in the pool, play tennis, go to the gym, or just relax on the balcony overlooking the a Brisbane River and inner city buildings. Our stay at The Mint was great. The apartment is very modern and clean. Rooms were very comfortable and we also got our request for 3 queen beds in our 3 bedroom apartment. Well-equipped kitchen and we had a nice view of the river and story bridge. Location was in a quieter portion of the city which we liked. Secure parking is available, but at an extra AUD25/day. We had a very comfortable stay here. It was right in the city so we could walk everywhere. We were on the 26th floor in this very modern stylish apartment building. Quite cool. We had the best stay for an overnight stop. Right near the river, near the botanical gardens so close to all the shops etc. The place was modern and stylish and were on a high floor - so that even though it was not an expensive room new had excellent views of the city. It was all quite classy. It seems like a building that is both privately owned apartment - some renting out as part of the Hotel. As we arrived after 6 pm there was no-one at the front desk - but there was a well organised key depot that was easy to access once a phone call was made. All in all it was a great stay. Easy to walk to Eagle Street Pier and Story Bridge. Also walking distance to Queen Street Mall. Convenience shop downstairs is quite well stocked. We had problems locating Mint Brisbane because it is actually located within Skyline Apartments. Shower system could be improved, it is on the weak side. Poor views with little privacy. Internet/WIFI is not free, it cost AUS19.95 per day.